The latest and most advanced Spinal Decompression technology is at Align Health and Wellness. In most all cases, the treatments are completely painless. In fact, some people fall asleep during the spinal decompression session. The number of sessions needed and your specific treatment plan will be determined by Dr. Gill at Align Health and Wellness. Anyone who is suffering would benefits from the positive effects of spinal decompression at Align Health and Wellness. 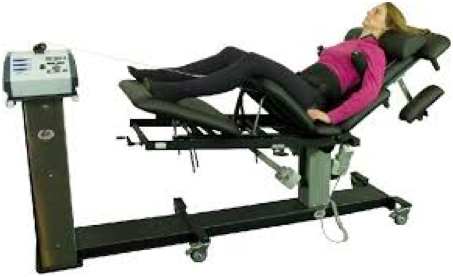 We have the latest model of the spinal decompression machine in the Naperville and surrounding. Don’t settle for old dated decompression technology at other locations. Expect the best at Align. Dr. Gill has extensive training with spinal decompression and has treated hundred of patient. Dr. Gill’s skill combined with the computerized traction head is key. You will be properly assessed and correctly positioned with the use of pre-programmed patterns of distraction and relaxation. This will reduce disc pressure allowing nutrients to accelerate disc healing and taking pressure off the nerve, providing much needed relief! Spinal decompression has saved many people from spinal surgery. If you are suffering from a degenerated disc, herniated disc, or sciatica, don’t risk surgery until you have explored safe and effective spinal decompression at ALIGN! Contact us to schedule your free consultation appointment!